I was going to write a long essay on why I try to avoid advocating for any one particular policy for climate, but I think this probably makes the point fairly well. One of the funny things about the hoo-ha around Tamsin’s piece was that the reaction rather confirmed the point*. 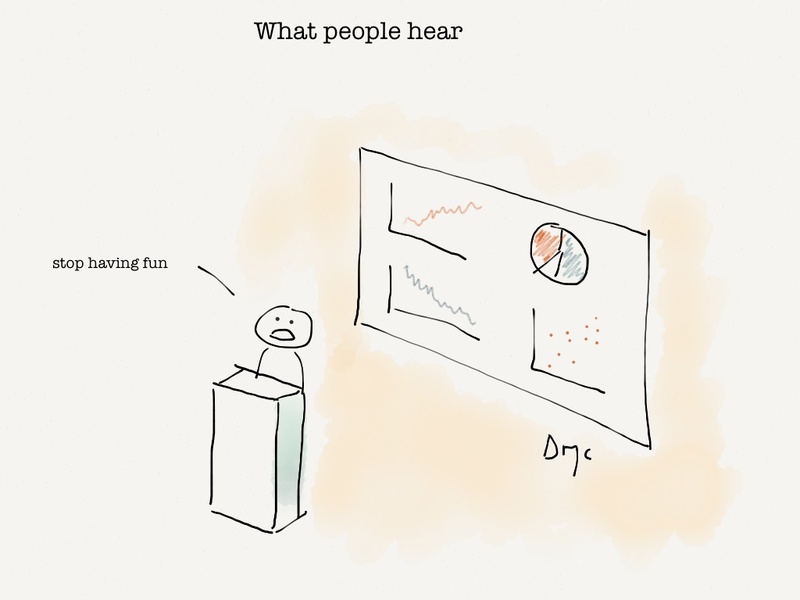 People hate hate HATE being told what to do (especially scientists), and many seemed to have an emotional reaction to the idea that some young upstart was telling them they were doing the wrong thing. As a result, there was lots of building of straw men; “she’s advocating not advocating” (not true); patronising (“foolish”, “naive”); and likening to other Female Scientists who Happen to be Prominent in the Blogosphere. Basically, the whole discussion was quickly polarised into an argument, obscuring some of the subtleties, positions, and valid points made by both sides. It remains to be seen whether anyone has shifted position on advocating for climate policy due to the piece: I guess it will take a long time to work through. * This post shouldn’t be read as a criticism of Tamsin’s piece, the discussion needs to be had. To get even more meta, I guess I am sustaining the adversarial nature of the debate on this. Ho hum. I don’t have a problem with those scientists who advocate solutions. Neither do I have a problem with those scientists who won’t advocate solutions. I do have a problem with scientists who do work that shines a light on potential problems for society and then won’t go on to lobby for those problems to be considered seriously and be addressed by policy makers. Is that too much to ask? Of course the biggest hypocrites of all are those who advocate the policy of doing nothing and yet attack as advocates those who propose doing something. Reblogged this on Biodiversidad Molecular. if reducing co2 emitted was indeed ‘simple’ – (and or/cheap) we would be doing it..
it is not ‘simple’ – it involves (as Kevin Anderson states) radical change to economies and industry, etc,etc,etc. 1) It was just an example of something a scientist might say. 2) I think it still stands a very good chance of being true. It says “simplest”, not “simple”. yeah .. I though that as well! then goes on to say, even this [simplest] drastic measure…..
some people ‘hear’ the risks are overstated, and the risks of the drastic policies, will have totally unnecessary drastic consequences..
No, that’s not something they “hear” in the scientist’s words, it’s a judgement they make based on their own pre-existing viewpoint. The issue is that policy elites keep mis(using) science to support particular policy positions, so if you don’t use the science to advocate, it will be (mis)used by powerful actors to promote their own agenda. is it advocating science (or correcting errors) to say ‘science’ does not support a certain policy statement? should a politicians misuse science? 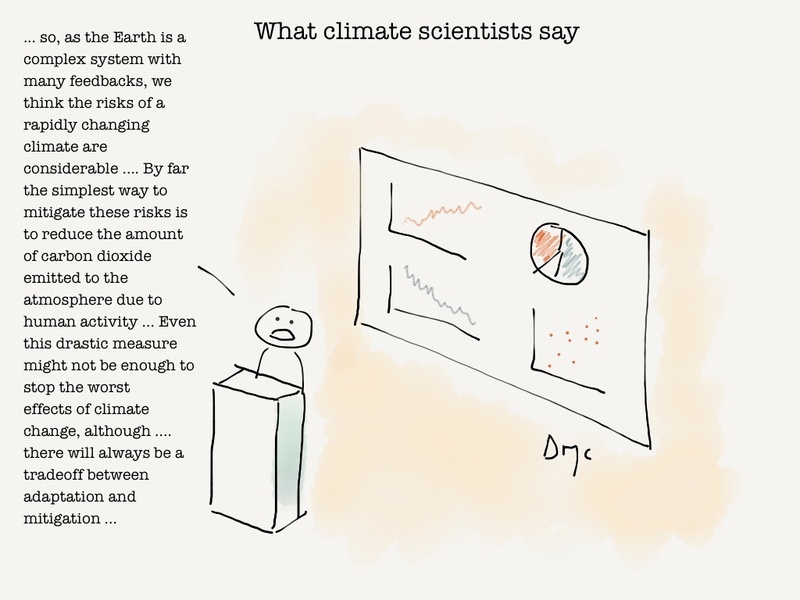 I do realise the need to be careful how one puts across such a message, but sometimes it really is necessary to tell people “we have a serious problem and we need to do something about it” and in the case of climate change the kind of language used by the scientist in the cartoon seems entirely appropriate. If that really is going beyond the bounds of acceptable advocacy and/or people really are that reluctant to accept any information which may have negative implications for their immediate lifestyle and financial wellbeing then we really are scr*wed.
What’s more, just saying “the simplest way to mitigate risks is to reduce CO2” does not make you a policy advocate. Reducing CO2 is a strategy, there are various different policy options which could be used to achieve it. Maybe that seems like hair splitting, but I think that “reducing CO2 will mitigate the risks of climate change” is a scientifically valid argument, as opposed to, say “implementing a carbon tax will mitigate the risks of climate change”.